Nevada Divorce Insights is a forum where we discuss various aspects of the divorce or annulment process from the perspective of a paralegal with 20 years of experience filing with Nevada family courts. When Nevada achieved statehood on October 31, 1864, the requirement to become a bona fide citizen of the state was continuous residence for six months. Once an official citizen, a resident could vote and file a lawsuit, including divorce suits, in a Nevada court. After 1900, as the six-month Nevada divorce gained in popularity, its opponents increasingly denounced the trade as harmful to Nevada's reputation as well as to society in general. In 1913, the Nevada state legislature bowed to pressure from Progressive reformers, religious groups, women's organizations, and other critics, and lengthened the residency requirement to one year. Almost immediately, the divorce trade crumbled, and business owners and lawyers were up in arms. The next time the legislature met in 1915, order was restored along with the six-month residency period. 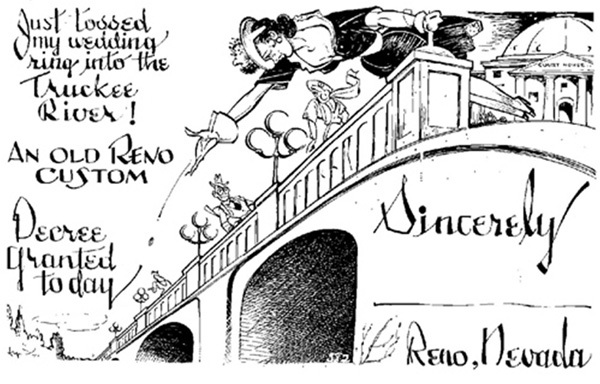 The Nevada legislature took another look at the divorce laws in 1927 in response to a perceived threat to Reno's divorce supremacy from France and Mexico and a divorce-trade war that had been going on since the end of World War I between Nevada, Idaho, and Arkansas. The legislature voted to reduce the residency requirement to three months and added two years of insanity as an additional ground for divorce. Some suspected tomfoolery and asked the state Supreme Court to rule on the act's constitutionality, but the Supreme Court upheld the law in August. In 1931, in an attempt to help secure Nevada's economic health through the Great Depression, the state legislature dropped the residency requirement to an unheard-of six weeks. In the same session, the state legalized wide-open gambling, ensuring even more entertainment options for divorce-seekers. 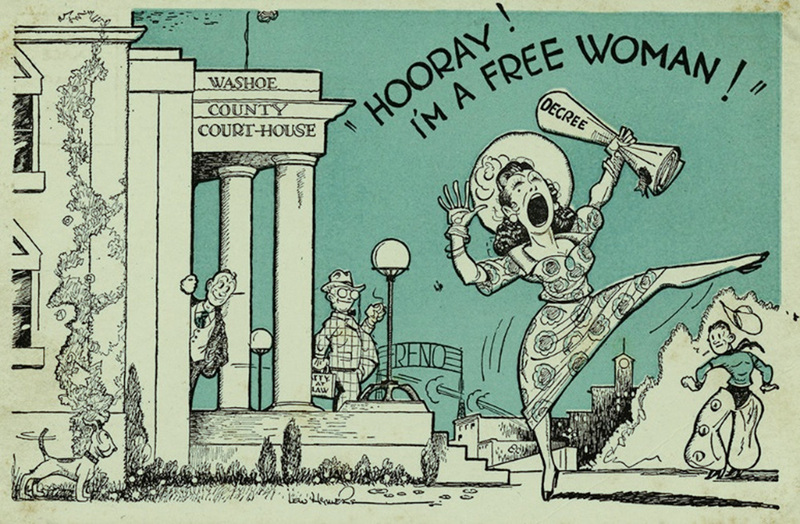 More than 30,000 divorces were granted in the Washoe County Courthouse during the 1930s. And indeed, Nevada did emerge from the Depression relatively unscathed. Rumor has it that many divorcees would toss their wedding ring over the Truckee River Bridge. Many have said they would purchase cheaper rings at local stores. For some, the residency period for divorce also served as the countdown to a wedding. An advantage of divorcing in Nevada was the ability to immediately walk down the aisle with someone else. 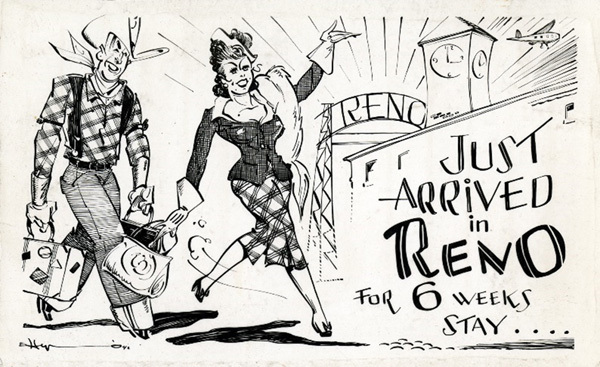 In many cases, divorce-seekers brought their future spouses to Reno to wait out the residency period together, or arranged for them to arrive in town upon its completion. Tales abound of divorce-seekers who received a divorce decree in the morning and tied the knot with someone else that very afternoon, with both proceedings sometimes officiated by the same judge. In this as in other marital arenas, Nevada's liberal laws long attracted residents of other states. Back in 1897, California had prohibited remarriage within a year after receiving a divorce decree, prompting many elopements to Nevada, which had no such policy. Such marriages were suspected to be legally invalid until 1902, when a decision of the California Supreme Court determined that all divorces in the state were absolute upon the conferral of the divorce decree, rendering any subsequent marriage legitimate. Throughout the 20th century, many states retained bans on remarrying immediately after a divorce, enacting waiting periods ranging from one month to a year, depending upon the circumstances, and some restrictions remain even today. In contrast, Nevada has never raised impediments to marriage, requiring no blood test or waiting period after securing a marriage license from the county clerk. What is the Basis for an Award of Alimony? Do you have a topic you'd like us to discuss? Do you have questions about the divorce or annulment process? Let us know about it below. NOTICE: Registrant is not an attorney authorized to practice in this State and is prohibited from providing legal advice or legal representation to any person. Registrant number with Secretary of State license is NVDP2014336.